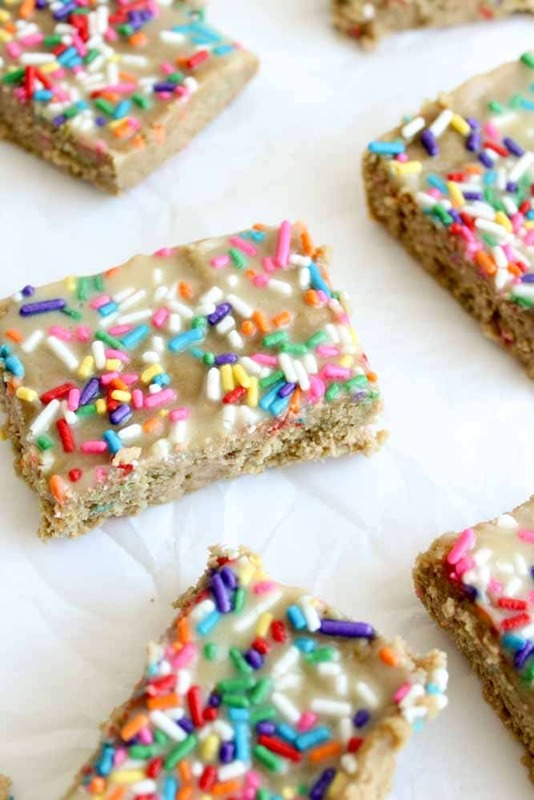 Healthy Funfetti cake batter protein bars made with cashew butter, oat flour and lots of other awesome healthy stuff. They’re paleo and gluten free so they’re perfect for everyone out there! Seriously you guys, I think these bars speak for themselves. Sprinkles make healthy things (and life) so much better. 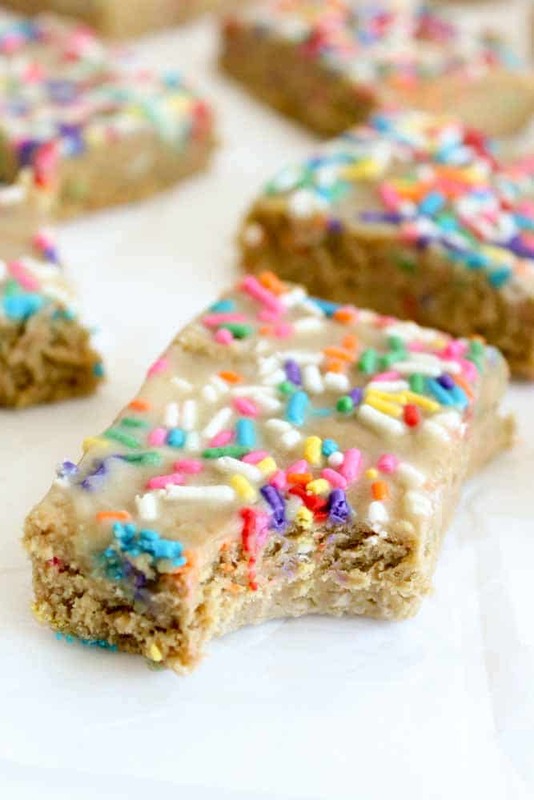 They’re just a party on a plate and brighten up any time of the day when I want to gobble these protein bars up. And that’s exactly what I did. Morning, noon and night I had one of these. My typical morning usually goes something like this: work out, shower, get dressed, get dressed again (because I hate my first outfit), do my hair, watch Good Morning America, then determine what I’m going to make/eat for breakfast with the last 4 minutes before I have to rush out the door. Sometimes it’s egg whites and veggies, sometimes it’s a breakfast smoothie, but the majority of the time it’s anything I can grab as quickly as possible. 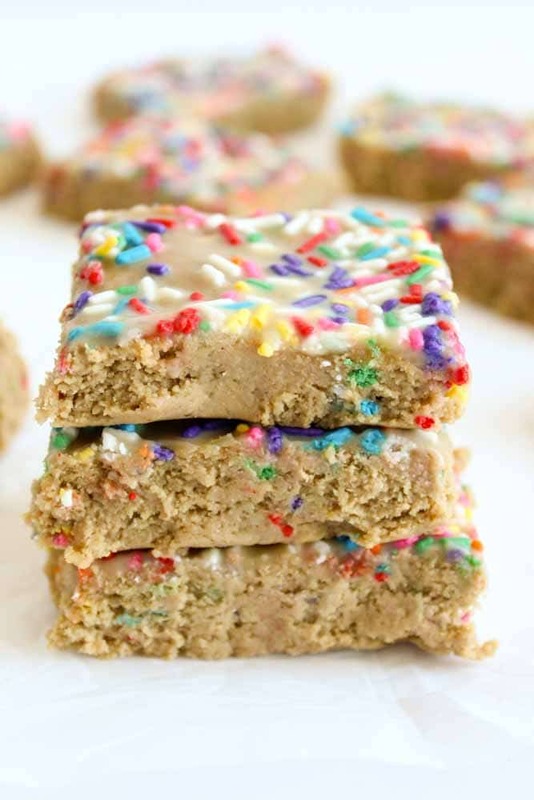 Needless to say, these funfetti protein bars have been clutch for my morning routine. A sweet, chewy and very healthy bar filled with everything I need in the morning. I just grabbed one and ate it on the road for a week straight! Then I packed it in my lunch and ate them again in the afternoon. Just look at them! Nuff said. Line a 9x9 inch baking pan with parchment paper. Set aside. In large bowl, mix flours, protein, sweetener and salt and mix well. Combine cashew butter and syrup in microwave bowl and heat until melted about 30 seconds. Stir together until smooth. Pour mixture into dry and mix until well-combined, about 3 minutes. Add vanilla and milk and mix well until a firm batter is formed. If necessary, add more milk by the tablespoon until the right density is reached. Transfer dough to lined baking dish and press down firmly to create an even layer. For the glaze, mix all ingredients in a small bowl and slowly add the milk until desired consistency is reached. Pour over bars. Refrigerate for at least 30 minutes to firm. Cut into square or rectangle pieces and store in the fridge for up to one week. I’m not exactly sure what you mean by syrup. Can you explain? Do you know an alternate ingredient that could be used? Hey Melly! We used sugar free maple syrup. You could also use agave nectar or honey if you prefer! Looks like there’s a glaze or something on top? But I don’t see it in the directions. I made these and they have been in the refrigerator for about 2 hours… Not quite firm enough yet- might try the freezer? Hey Amanda! Give the freezer a try and let us know if they firm up. They should be firm enough to cut into squares but they are meant to be chewy! hey there, your recipe calls for 2 tablespoons of steavia, is that right? steavia is sooooo sweet! I’ve never used that much in a recipe. Hi Jennifer! Yes, that is correct, but you absolutely don’t have to use that much if you don’t want to. I have a sweet tooth:) You can reduce to one tablespoon or use honey instead. Thanks! this recipe calls for 2 tablespoon steavia. Stevia is soooo sweet. Is this measurement correct?